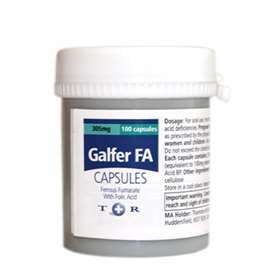 Galfer FA Capsules are used to prevent and treat iron and folic acid deficiencies during pregnancy. They contain 305mg Ferrous Fumarate and 350µg Folic Acid. Each capsule contains 305mg Ferrous Fumarate and 350µg Folic Acid. For the treatment and prevention of iron and folic acid deficiencies. For the prevention and treatment of iron and folic acid deficiencies. Pregnant Women: Take one capsule daily or as prescribed by the physician. Not recommended for men, non-pregnant women or children. 305g Ferrous Fumarate BP (equivalent to 100mg elemental iron). 350µg Folic Acid BP. Microcrystalline Cellulose. Prolonged use should be under medical supervision.